If you are a customer applying for an extension of credit, please complete our application below. You may print the PDF form and mail or fax it to our Spring Valley office upon completion. 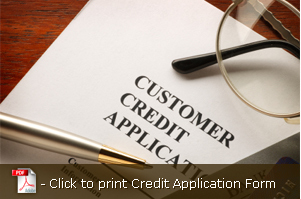 Alternatively, you may submit your application of credit online. WE HEREBY APPLY FOR AN EXTENSION OF CREDIT BY YOUR FIRM. THIS INFORMATION IS SUBMITTED AS A BASIS FOR YOUR CONSIDERATION OF OUR APPLICATION. WE BELIEVE THAT OUR FIRM IS FINANCIALLY ABLE TO MEET ANY COMMITMENTS WE HAVE MADE AND EXPECT TO PAY Cosgrove Distributors, Inc. INVOICES ACCORDING TO TERMS. HOWEVER, I AM AGREEABLE TO AN INTEREST CHARGE OF 1 ½ % PER MONTH ON ALL PAST DUE INVOICES. I authorize the creditor and its assignee to make whatever inquiries it deems necessary in connection with this credit application and in the course of review or collection of any credit extended in reliance on this application. I further authorize any person or consumer reporting agency to complete and furnish to the creditor and its assignee any information that it may have or obtain in response to such inquiries and agree that such information, along with this application, shall remain the creditor's and assignee's property, whether or not credit is extended. All information stated in this application is declared to be a true representation of the facts and made for the purpose of obtaining the credit requested. - I agree to the terms and authorizations above.